Will Anze Kopitar Finally Take Home the Selke Trophy? In the final installment of a three-part series examining major individual awards Kings players are in the mix to win, the following piece takes a look at Anze Kopitar’s case to win the Frank J. Selke Trophy — the award given to the NHL forward who demonstrates the most defensive skill in a particular season. The previous two articles profiled Drew Doughty’s quest for the Norris Trophy and Jonathan Quick’s chances to win the Vezina Trophy. If you aren’t in the mood to read the pieces, let me explain. No, there is too much, let me sum up (cue The Princess Bride music). Neither may be the favorite, but both are in good positions to win their respective awards, assuming the chips fall the right way and the alleged “East Coast bias” doesn’t stand in the way. What about Anze Kopitar and his chances to win the Selke? As one of the NHL’s elite centers for his entire ten-year NHL career, everyone knows Anze Kopitar. He rarely misses games, having played in 75 or more in every year except his rookie campaign (72) and the lockout-shortened 2012-13 season. He’s as all-around as they come: a goal-scorer, distributor, penalty killer, power play anchor and part of the Kings’ leadership caste. He’s also a two-time Stanley Cup champion. He’s been in the hunt for the Selke in the past, finishing fourth in 2013, second in 2014 and third last year. Along with Patrice Bergeron and Jonathan Toews, Kopitar has become one of the names that is always in the discussion. Unlike Bergeron and Toews, however, the prize has so far eluded his grasp. David Satriano of NHL.com wrote an article a couple of weeks ago in which he summarized Kopitar’s case to win the Selke this season. Kopitar is one of the League’s best faceoff men, winning 52.6 percent (759-for-1,442) this season, including 54.2 percent in the defensive zone. Kopitar ranks sixth in SAT percentage (shot attempts differential at 5-on-5) among players who have played at least 30 games at 57.62 percent. He also plays in every situation. Of his 20:53 ice time per game, more than two minutes each have come on the power play and on the penalty kill. It shouldn’t be understated how big of a role he plays defensively for the Kings, who have allowed the fewest goals per game (2.3) in the League. Kopitar is a big reason the Kings are in first place in the Pacific Division and looking like a Stanley Cup contender. Unlike with Doughty and Quick, Kopitar’s case for the Selke is a bit muddled. He places well in Goals For % (the share of goals scored by the player’s team as compared to all goals scored while that player is on the ice) and ranks first in Corsi Against, but most of his defensive numbers are somewhere in the middle of the pack. Kopitar is an outstanding defensive player — nobody would deny that fact — but there isn’t a clear-cut argument that can be made in the bevy of numbers the voters will likely sift through. Does that mean he doesn’t have a good shot of winning the Selke? Hardly. As with Doughty and Quick, it’s conceivable that voters will place emphasis on a variety of non-statistical factors, not the least of which is that he’s come close in the past and is arguably overdue for the award. In 2011, Kopitar received his first Selke consideration, finishing ninth in the overall voting. After finishing ninth again the following year, his trajectory rocketed upward to fourth in 2013, second in 2014 and third last season. Kopitar has reached the point where consistency, team success and reputation may play as much of a role as the numbers themselves. That’s a status previously enjoyed by Datsyuk, Bergeron and other multiple-time winners. Will Kopitar Win the Selke this Season? 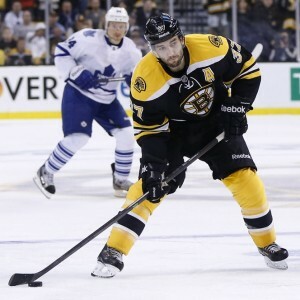 Patrice Bergeron: As the two-time reigning winner (three times overall), Bergeron is certain to be a finalist yet again this year. Arguably, he’s the front-runner. Jonathan Toews: Universally hailed as one of the best defensive forwards in the game, Toews has won it once already and has been in the top three for the past three seasons. Ryan Kesler: Kelser won the Selke in 2011, is winning 59% of his faceoffs and has a Corsi For % of 54%. Joe Thornton: Thornton may seem like a long shot because his defense isn’t the first thing discussed about his game, but he has received Selke votes nine times in the past ten years. Furthermore, Thornton is strong on the dot (52.4%), Corsi For % (56.3%) and is a plus-27. With heavy competition and not having a clear statistical case to win it, Kopitar’s chances this year appear so-so. His reputation and overall excellence will likely make him a finalist, but that characterization applies to Bergeron and Toews as well. In the end, he will probably fall just short once again. @expomick Anze Kopitar should get some consideration. Plays in all situations. Top 10 in points. Selke finalist. Complete player. Can you just imagine an LA sweep? ?